Welcome to our herd! These natural and beautiful floor coverings are a real style statement. We’ve been selling cow hides now for over 10 years but why buy a cow hide from us? Well…..
1. 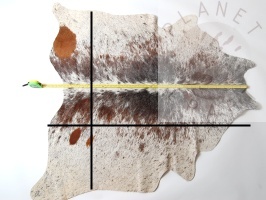 Our cow hide rugs in UK are top-quality hides; strong, supple and clean. Each hide is selected by our cowboy friends in Brazil and is of the highest quality and look really good. Quality hides are quite heavy, thick, clean (unmarked/cut) and fold without resistance. This means they lie flat on the floor or drap/hang with ‘weight’. We select from the finest cattle in South America. Brazilian hides can be excellent and Argentinian hides are generally good quality and little cheaper. 2. Each of our hides is full of character. We have selected luxurious soft cow hides in a variety of shades, sizes, colours and markings that can be matched to its settings. We photograph each one to allow you to make an informed choice. Choose the hide that is the right size for you and select the colours and patterns you like. Ours are all beautiful and we’ve named them. 3. Price includes free delivery to most UK addresses (delivery). Just order, unwrap & enjoy. Measurements are taken along the black lines, as shown on the image below.